Hi Paula, thanks so much for your informative website and blog. over the years i have collected a lot of native american jewelry and unfortunately i lost most of the details of each piece. i am still looking for the excel spreadsheet i used to track the details but so far can’t find it. 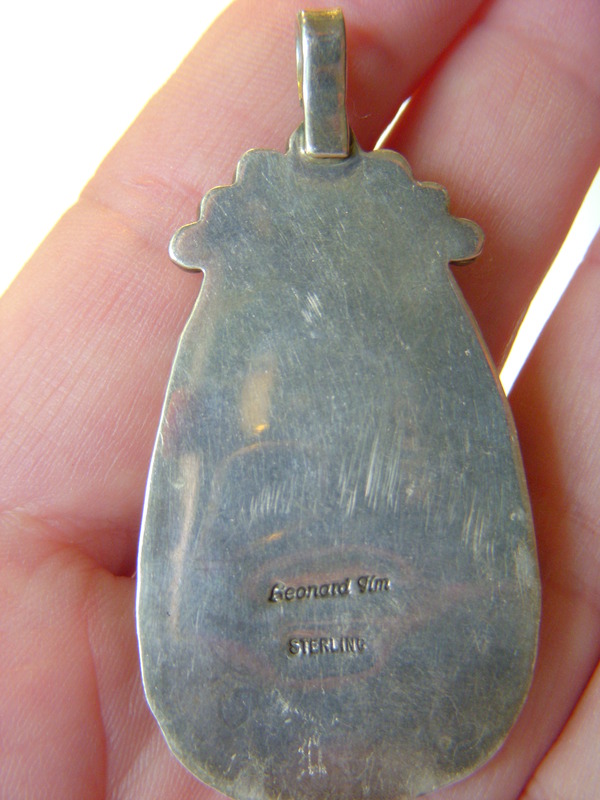 about 25 years ago in Jackson, WY i purchased a turquoise pendant with the hallmark “Leonard Jim”. i think the turquoise is Number Eight. what is the biography of the Navajo artist Leonard Jim? 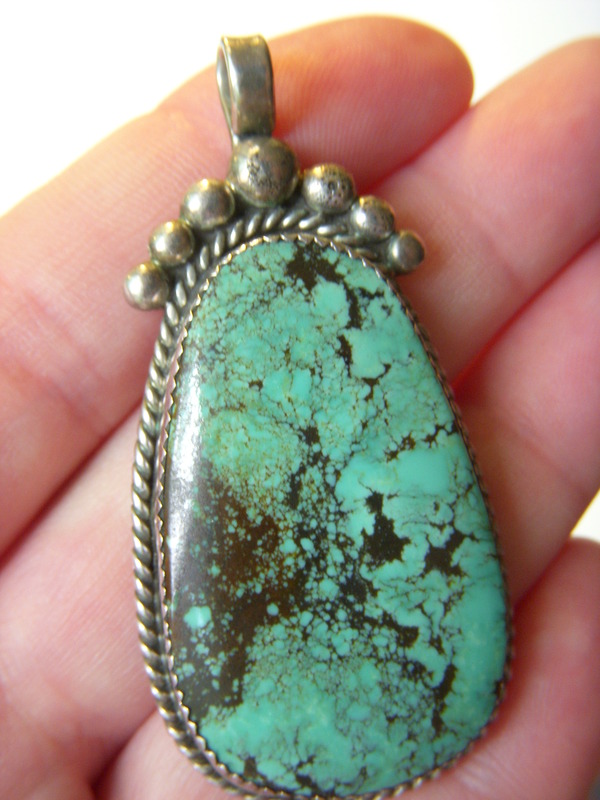 what type of turquoise is in my pendant? how can i find out? Thank you for your patience. As you can see, due to the volume of questions we receive, it takes about a month for a question to work its way to the top of the queue. Leonard Jim is a contemporary Navajo artist who is noted for mosaic, channel inlay, silver overlay, stamp work, applique jewelry and buffalo dance rattles. His favorite designs include the kokopelli, horse, pictorial and storyteller. He lives in Gallup, New Mexico. He signs his pieces with his full name as on your beautiful pendant and also as LJ. As far as what type of turquoise? 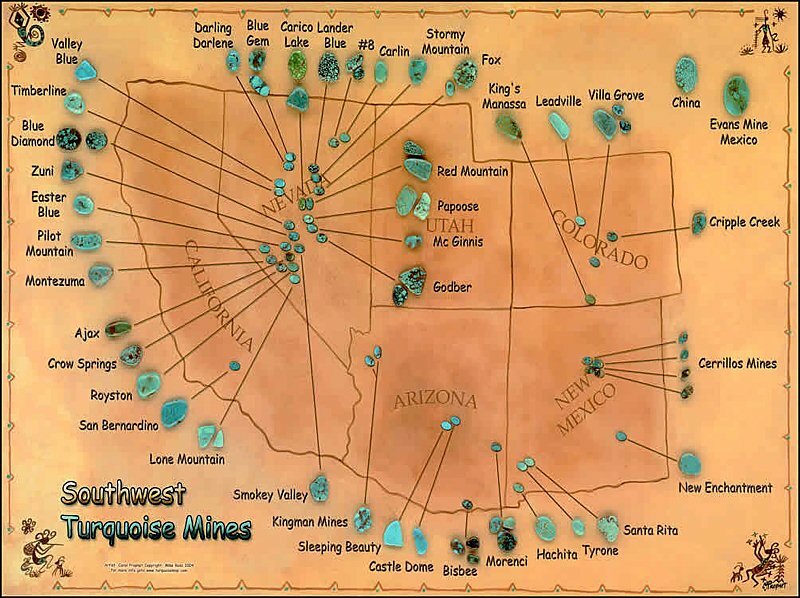 Number Eight (also #8) refers to the name of a turquoise mine near Carlin, Nevada. You’ll see it in the top row of this map. Stones from that mine are typically exceptional spiderweb turquoise with the matrix ranging from golden brown to almost black, but a deep golden webbing is most characteristic. Yours certainly looks like it could be #8.